So this will be my first Drivers Training/Drivers Education eventh with the PCA. It is being held this coming Friday, Saturday and Sunday. I am all set with the tech inspection done on my 964, new rear brake pads, new helmet, and a hotel room already booked. The event is being held at Brainerd International Raceeway in Brainerd, MN. It is about a 5 hour drive from my house, but promissess to be worth every bit of the trip. One must not forget that the trip in iteself is the destination. Esecially while driving a 964. Has anyone tracked their 964s in a PCA Drivers Education event or have they participated in a PCA High Speed Driving Drivers Training Event? I'm interested in any feedback I can get. Are there any special mods which need to be done to the car in preparation for track time? 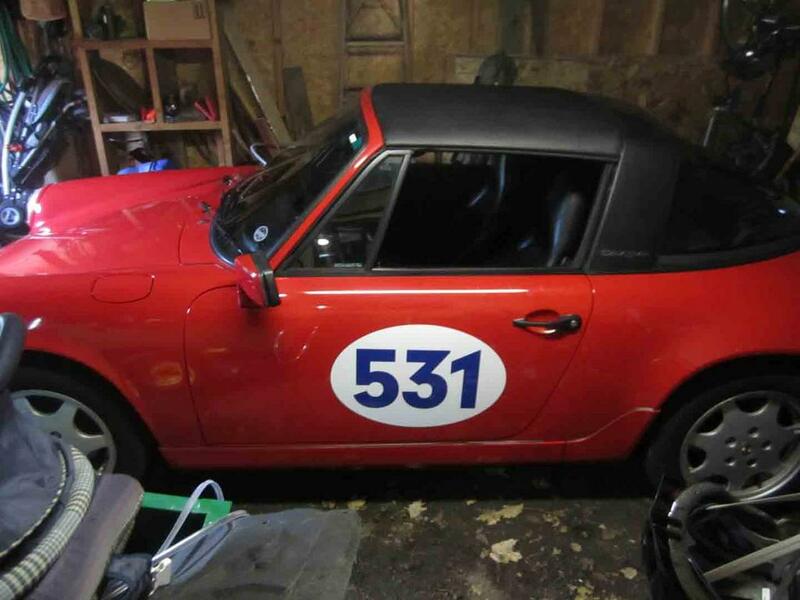 Attached is a picture of my pretty little 964 with her new clothes on (in the form of magnetic numbers) I keep her in the shed as that is where she feels most at home. She is not pretentious like my BMW that demands a garage space. I've done lots of spirited parade laps at BIR. You are in for a ton of fun! The only real recommendation I have are tire pressures. Measure them at the end of every session. I try to keep them at 36 psi hot but you might start a little higher initially.